So–bring along holey socks, dropped hems, missing buttons, evidence that clothes moths have left their babies to feed in your drawers and whatever else is plaguing your wardrobe and we’ll see what we can do! In preparation for the big event, I am constructing mending kits. No doubt some people who come will be dedicated menders. Others may not be so well equipped, and these kits are for all comers. 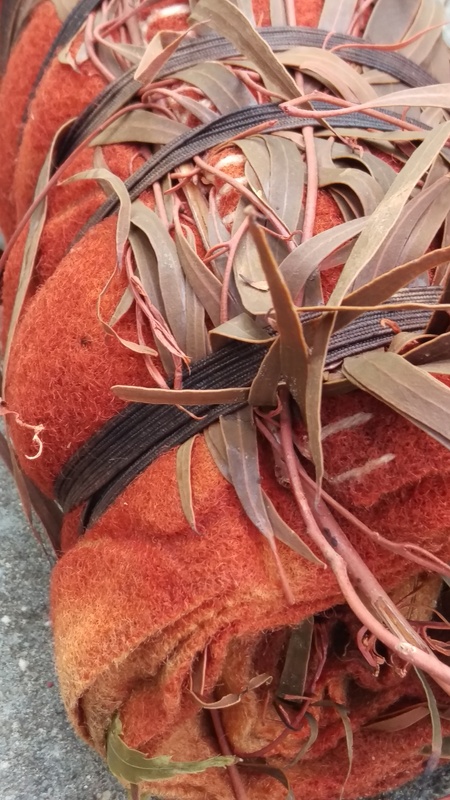 I began with a leftover scrap of woolen blanket dyed with pohutukawa leaves. 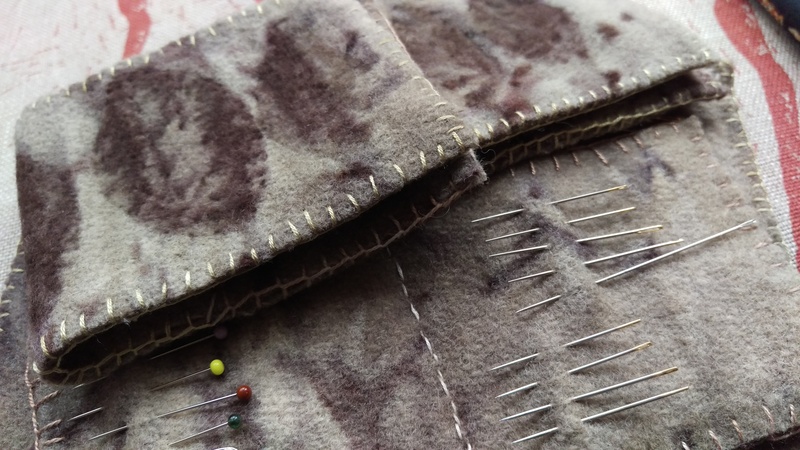 Soon, I had a little pile of hand-stitched needle books complete with pins and needles and suchlike. 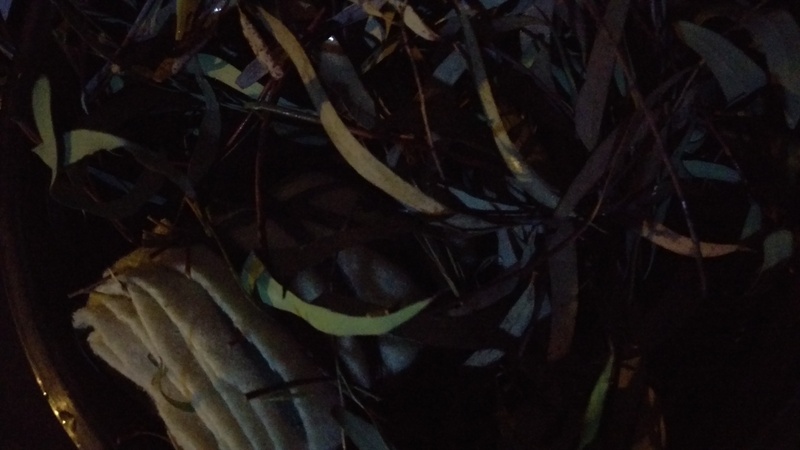 Meanwhile, the call has gone out for boxes and tins for the kits to go into and tins formerly full of tea or chocolate and all manner of other good things are trickling in. 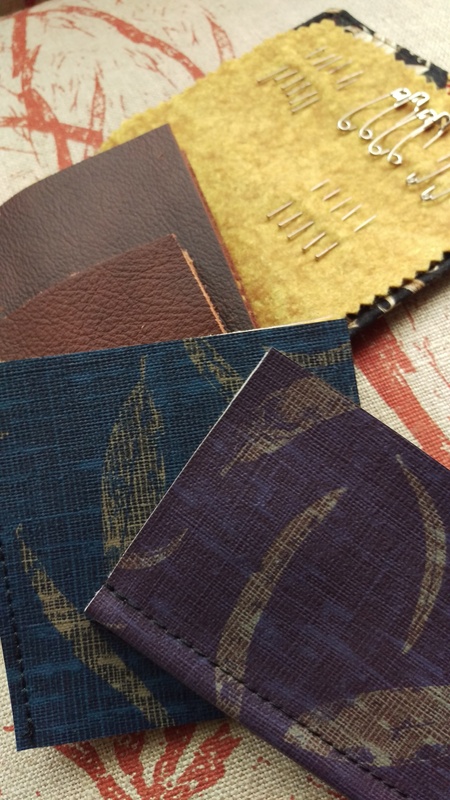 Then I started on needle books made from fabric scraps, and since I found some woolen felt of unknown origin rolled up in the cupboard, I tried some with scrap leather and vinyl samples as covers with felt pages within. My grandmother’s pinking shears were pulled out for use rather than wonderment for the first time in ten years, at least! And it may be this is enough to make needle books for everyone I know. I have just booked!! It looks fantastic. Great, Keryn! Delighted you can come. I’ll look forward to meeting you. Is this finally the nudge to get myself on a plane to Australia??? Would love to participate…I’d have suitcases full of “patients” too. Much success and fun!..no, that should be fun and success. The first makes the second. PS Something I’ve been meaning to ask: when you do your patchwork squares, using up all the tiny fabric pieces, could you show a photo of the back side? As a non-quilter, I can’t quite get my head around how you piece them. Thanks! I wish you could be there! And thanks for the reminder to put fun first. The patchwork squares are foundation pieced. So first I have a square of tired old fabric the size of the finished piece. the latest purpose to which threadbare clothing is being pout at our place. 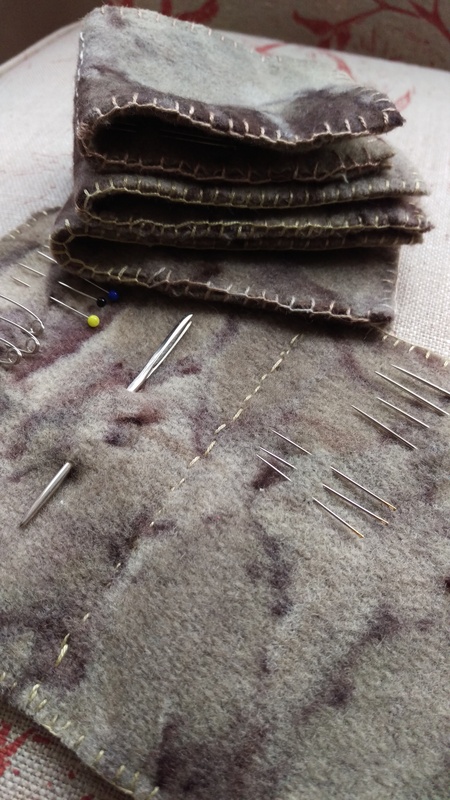 Then I sew a square onto the centre of it, and then I stitch each strip in turn, face down, to the edge of that square, and then flip the strip right side, concealing the seam. I’ll try to remember to take a photo! I checked on Youtube but what is being demonstrated there is not terribly similar–it seems people piece on a paper foundation, which is news to me. Mind you, when I looked at a few quilting videos on YouTube it did remove all mystery about why other people’s quilting is neater than mine. Not that I was in a lot of doubt! What I am doing is more like what Jude Hill demonstrates here. But I do iron, and use a sewing machine. You’re welcome! I am glad that Jude Hill’s video hit the mark and might motivate you. 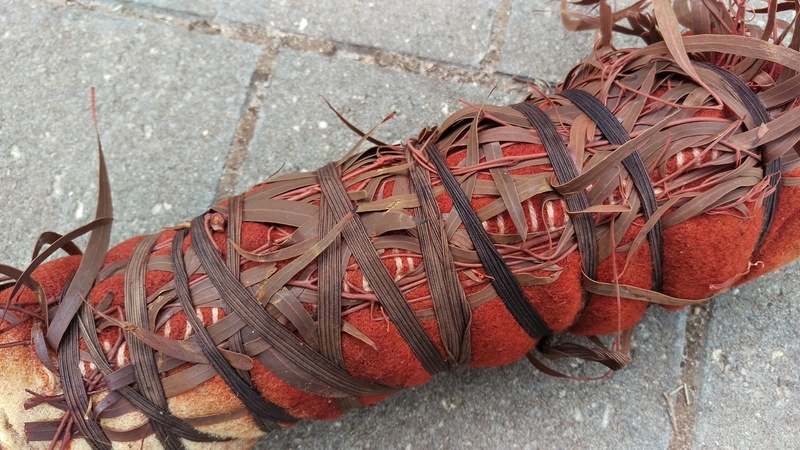 I think there is so much time for craft to be made by finding ways to have it always at your elbow ready for those crevices of time that can be quite aversive (waiting for the bus) or entirely lovely (stitching at the bus stop). Knitting in particular has allowed me to look forward to things I used to find dull or unpleasant. I value meetings and other times of collaboration, but even when going to a meeting I have low expectations about, or to appointments where I am on time but expect to have to wait, I can now think: ahh, knitting time! Aw! I want to go! It’s going to be wonderful, I’m sure. What a great idea! It would be so fine if you could be there! I am delighted to be asked to run these workshops. 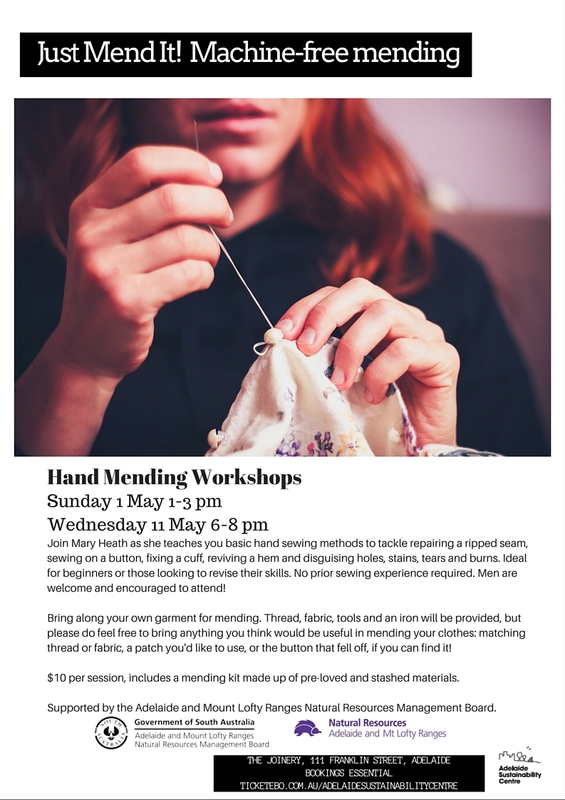 I’ve spent many hours setting up the mending kits already… and have begun gathering tools (Readers’ Digest books on needlecraft to gift away, thread, wool, darning mushrooms, chalk, fabric…) Should be fun and not long to go now!